Reader Greg Hill sent us a letter he wrote to the Seattle Mayor and City Council questioning its decision to triple its commitment to private equity when they’ve not only consistently underperformed their benchmark for that strategy, but even done less well than if they had simply invested in US equity. That letter led us to look at a request for proposal (RFP) that the City of Seattle Retirement System issued just a few weeks ago, where it is seeking an advisor to manage its private equity program. We’ve embedded it at the end of this post. · An annualized dollar-weighted internal rate of return (net of fees and expenses) in excess of 3% above the Russell 3000 Index return. · An annualized dollar-weighted internal rate of return and return on invested capital multiple (net of fees and expenses) in excess of top-quartile benchmark represented by Thompson Venture Economics, on a comparable vintage year basis. This statement is revealing, and not in a good way. Mind you, it’s not because the City of Seattle is unusual for expecting that it can consistently out-invest more than 75 percent of private equity limited partnership investors. It’s the opposite. Seattle’s investment objective is revealing because it’s the stated goal of almost all LP investors in private equity, who almost universally believe the mathematical impossibility that all of them can assemble a portfolio of PE funds that will beat the performance of three quarters of their peers. This graph is more straightforward than it might seem at first glance. It shows the dispersion of private equity fund returns (referred to as “IRR” as in “internal rate of return”) by year, broken out by quartiles. The bar in the middle portion of each year’s line represents the returns of funds between the 25th and 75th percentiles (the convention is that higher percentile means better returns, so if a fund is 75th percentile, it did better than 75 percent of other funds). So the top of the bar is the 75th percentile, and the bottom is the 25th percentile. The line extending above the bar stops at a red square that is the mid-point of returns for top quartile funds in a given year, presumably 87.5th percentile of performance. Similarly, the line extending below the bar stops at the X that is the mid-point of bottom quartile performance, presumably 12.5th percentile of performance. Finally, the green triangle is the median fund performance for a given year. 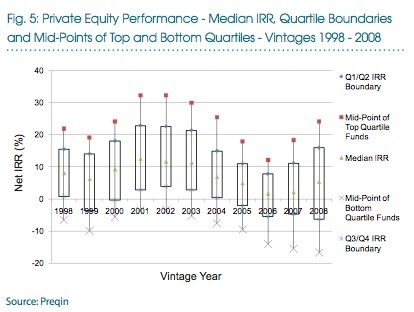 The main thing you can see from this graph is that median performance (the green triangle) in private equity isn’t all that hot, barely beating 10% in the three best years from 1998 to 2008, and the rest of the time hovering below that level. Moreover, if you performed moderately worse than median, say 40th percentile, your performance looked like a bond return at best, and if you only achieved 25th percentile, this chart says that you could have lost money investing in private equity over this period. By contrast, if you achieved “in excess of top-quartile” returns, the stated goal of Seattle, and landed on the red square, private equity was very generous to you, providing annual returns approaching 20 percent or better every year but one. Finally, let’s flag a couple of other absurdities in the Seattle RFP. First, as you can see from the excerpt above, Seattle is seeking an advisor who can generate both above top-quartile returns and do so consistently. It violates the laws of financial physics to embrace these two goals simultaneously. It is a bedrock principle of investing that higher returns comes with more risk, which means more volatility. In other words, even when high returns are achieved, they’ll probably be bumpy. An intellectually honest reaction to this RFP would point out this inconsistency of goals and say: “I can aim for high returns, or I can aim for consistent returns. Neither I nor anyone else can plausibly promise to aim for both simultaneously.” Now, dear readers, how likely do you think it is that the City of Seattle will hear this sort of thing from the consultants competing for this gig? Finally, the RFP requires that the advisor must have been in business for at least five years and have at least three other clients. There’s a clear logical inconsistency between, on the one hand, a stated goal of becoming an outlier in terms of returns compared to one’s peers and, on the other hand, hiring an advisor to achieve this who has a significant business giving the same advice to one’s peers. The largest firms who are likely to respond to this RFP, firms like Cambridge Associates or Hamilton Lane, each advise a meaningful percentage of private equity investors. If Cambridge Associates advises 20 percent of PE investors, a reasonable guess, that’s presumably 20 percent of investors whom Seattle presumably won’t outperform. Put another way, a mainstream advisor means mainstream returns, by definition. It just can’t add up. This entry was posted in Investment management, Private equity, Risk and risk management on April 7, 2014 by Yves Smith. Yves, thanks for continuing to highlight the fundamental sadness (yet hilarity) of how pension funds are currently managed. It seems to me the fundamental point of contention is whether public promises to workers should be paid for by taxation or investment returns. If the latter, I don’t see how any other outcome is possible but poor management and gaming the system. There just aren’t enough investment returns to go around in a society where the top 20% control virtually all the wealth of the nation. One wonders who wrote the original of the PCA document. I’d be inclined to interview representatives of firms refusing to fill in the document and ask them what they think relevant information on whether to hire them actually is. I’d also expect all applicants to be able to whip up a spreadsheet showing returns from cheap mutual investments without a massive bureaucracy of alpha and beta gatherers and the people we’d have to hire to police them. Somewhere in the pedantry, one is asked to “give detailed answers of at least a sentence”! There is a total absence of sensible alternatives like buying out local firms and running them profitably on a long-tern basis. And where is the page on sharing cash-stuffed brown envelopes at management meetings in holiday resorts? Here in Canada, public servant salaries have shot up quite a bit over the last decade so if they are to get 70% of their income, that means a lot more money has to be injected into these plans to fund them. It used to be that incomes were lower than in the private sector and pensions made up for it but now incomes in the public sector have surpassed those of the private sector and benefits are further complicating the matter. This and the fact that there have been contribution holidays and wobbly markets has contributed to underfunding. But I would say that income levels or the discrepancy of those between the private and public sector are the biggest issue… a few months ago I heard a joke on the radio which asked who are most Canadian millionaires married to. Answer: teachers. A full time teacher over 40 in Quebec is probably making over 70K and in Ontario over 90K. So government has started to cut, taking away sick days, cutting COLAs and changing the formula from best five lyears to less onerous terms. But the uproar is deafening. There will be huge strikes… so governments have been passing laws that will restrict striking. As long as nothing changes, they have to keep up appearances and make pensions look funded… if not then then employers need to make huge injections which impact income statements or taxpayers. And to be able to use a 6%+ portfolio return estimate in this rate environment, you’ve got to change your asset allocation. So where it used to be 60% equity, 40% bonds. Now many are shifting some 10-20% in from bonds to alternative investments. We are caught in a vicious cycle of rigid pension regulation, pension and accounting rule mismatch, a huge divide between the public and private compensation package, a popular sense of entitlement, employers unwilling to contribute more than they have to and consultants using rear view mirror techniques to meet their client needs. So the underfunding problem is most probably related to the 50-65 group and NOT the older and younger cohorts. Many DB plans have been closed to the younger ones and most of those over 70 did not benefit from the recently boosted income levels. I doubt if it is that public sector incomes have been boosted, as it is that private sector incomes have been suppressed. It does not change the fact that there is a huge unhealthy discrepancy between the private sector and the public one…. maybe we should give the same pension the public sector gets to all retirees in the private sector… then we’ll see what happens when we print faster than we produce. How does the public sector know what a job is worth if it can’t base the value on the private sector or market forces? Don’t they just go to a second – third world country? Well if they made a history of actually making 75th percentile returns over the last 5-10 years, there wouldn’t be many PE managers eligible. Sure, that’s looking in the rearview mirror but, but that beats closing their eyes and hoping. The other bit we did not mention is 80% of the PE fund managers can cut their data (basically who they think the relevant universe is and over what time period) so as to be able to claim to be top quartile. Indeed, the first question that leaps to mind looking at that graph is, “How much turnover is there in the list of managers occupying the top quartile, year-to-year?” My baseless guess is that it demonstrates completely random selection, and you’d do just as well flipping coins to pick a fund manager — or just choosing an index fund. ‘We find that valuations, and reported returns, are inflated during fundraising, with a gradual reversal once the follow-on fund has been closed. Third, we find that the performance figures reported by funds during fund-raising have little power to predict ultimate returns. The issue seems to be missed anyway. The chasing of these returns is detached from the lack of productive investment in our next generation. Why don’t pension fund trusts have the good sense just to invest in index funds? There must be more graft than hype going on. You can’t beat index funds over time. Even if it isn’t enough to cover all the promises it’s better than being taken to the cleaners by the crooks. Makes me worry about other promises – like the promise that all countries around the world can simultaneously export their way out of their deficits…. well maybe if the earth will spin twice as fast. That does seem to be one of the great curiosities. Why dig such a deep hole? But I think it’s worth pointing out that index funds don’t solve any of the larger social problems of wage stagnation, inequality, malinvestment, corporate governance, and so on. In aggregate, index funds for public pensions just implement state communism – public holding of property. The top holdings of passively managed Vanguard funds like Russell 1000 Value Trust Index or S&P 500 Growth ETF or Russell 2000 ETF are just freeloading off of Somebody Else picking how to allocate resources in society. Somebody has to make the decision of whether to invest in Wells Fargo or prosecute them, of whether to protect the IP of Pfizer or not, of whether to cover up oil spills or investigate them. Somebody has to cast votes for Board members and hold management accountable and so forth. Etc. Anyone who complains about the activity of a particular company is making the case for active management, not passive management. Interesting point which I think leads directly back to big stock market actors like Treasury and the Fed who, for now, are force-feeding capitalism regardless of criminal behavior – It’s TBTF: “But wait, we can’t prosecute Wells Fargo because it would bring the system down.” And we know the rest of the story so far. To readjust and deleverage all this weirdness will take anywhere from 4 to 20 more years according to random estimates ventured on the internet. While I was reading about the topic I noticed a quarter of PE funds have deep political connections in ownership. One wonders where the pork starts or stops. And how are people denied what we call ‘final salary pensions’ supposed to have decent retirements if we already can’t afford the ones we thought we had paid for? Why would anyone want to choose the 75% losers? I mean, if you could spot that, you could win by shorting them! On receipt of completed questionnaires there is no need to appoint a firm. Yeah, well said. I predict the spectator sport of random internet guessing will continue for the next 4 to 20 years. Because relying on the returns granted by index funds (even though they are, on average better than managed funds) would require higher payments into the retirement funds by the operators of the pension funds. That is why we have this “Let’s win the lottery” plan. Investing in PE is a violation of a pension fund’s fiduciary responsibility which is primarily to protect the contributions of members by placing them in safe, conservative investments. Pension funds are doing this to achieve the unrealistic levels of return they have promised current and future pension recipients. It is a shortsighted, upside of a bubble strategy. They will be crushed in any future meltdown. I think they know this, but their thinking is this: Get the returns they can get now (and justify their salaries and bonuses) and when everything goes splat, leave it to government to pick up the pieces. The whole investing industry promise (with a possible exception of transparent ETFs) is based on violating fiducary duties. Collective investment is a scam to ride on public ownership (aka public shareholding) scam. Nice in theory, really bad in practice due to incentives misalignments, hence very suspectible to predators. That’s a very good question, because in the current economy it can’t base the value on either. With 11 Gross Global Products worth of money overhanging the physical economy, somebody with access to significant amounts of money can make anything have any price at all. Sammy Sosa hit 60 or more home runs during 3 of his years in baseball. Remarkable. An outlier. But even hapless Cubs fans knew he wasn’t going to hit 60 every year. To be honest, I empathize with the pension fund managers who are faces with a 8% yoy goal every single year. Yep, to keep with the Sosa analogy, these pension fund managers would cork his bat and juice him up in their effort to keep producing. You see, the problem actually lies, not with fund managers, but with the pols that saddle them with unrealistic expectations. Let’s face it, nobody can make 8% year after year. Thus, the real problem, the real cause of pension fund malinvestment is not the fund managers (although some are clearly crooks), it is the politicians who sign contracts, yet hold down taxes, thereby squeezing the pension funds and forcing them into bed with PE. This is not a marriage made in heaven. Now the question becomes – how do we get a divorce? Do not blame the pols for this. You have the wrong target. Public pension funds use the same return assumptions as private pension funds. And if you’ve read the financial press, the companies that have defined benefit plans (the same types as these public pension funds have) also for the most part have underfunding too. So the genesis of the problem can’t be politicians when supposedly more rational and sophisticated companies are in the same boat. So where do those return assumptions come from? Pension fund consultants, who are also in the business of advising the pension funds on their asset allocations (which strategies to pick) and which specific funds to invest in. Now do you see what is going on? The fund consultants were responsible at least in part, arguably in large degree, for the underfunding by providing unrealistic return assumptions. The underfunding now leads to the funds feeling they must invest in higher risk strategies. Those higher risk strategies are numerous and arguably hard to assess, justifying more consultant time and thus paying higher fees. I understand what you are saying, but I don’t think that responds to the comment. Sure consultants share the blame. Fancy pants consultants are widely discredited in our society to the extent they are mostly a joke outside of DC/Manhattan/Serious People. Just look at how The Bobs are treated in Office Space, a movie that is now several years old. But who hires the consultants? And more importantly, who acts on advice when the advice is patently stupid? Incompetence in management isn’t a defense; it’s an indictment! The honest consultants who report that returns of 8% aren’t realistic will not get hired. It’s a gresham’s law issue – the honest ones are driven from the market leaving. But that’s the thing. There is no market here. We’re talking about public pensions. These are choices made by government officials, not private actors.